Just a quick update to say that I’m moving teams inside Oracle. My new position is as Product Manager for the MySQL Server 🙂 This is a great opportunity for me to be more directly involved in developing MySQL, and something I’m very much looking forward to. It will also mean many of my future blog posts will appear on the MySQL Server Team blog instead of here on my personal blog. The second part to this update is to say that I’ll be touring Europe for almost all of February. You can catch me in Brussels, Amsterdam, Helsinki, Munich, Berlin, Madrid, Paris, Dublin, Manchester & London. Please check out the announcement blog post for more details! If you are in San Francisco on October 27, 2015, please come along to our MySQL team reception at Jillian’s at Metreon. You do not require an Oracle OpenWorld pass to attend, all we ask is that you please register in advance. In person: Both myself and colleagues will be at Percona Live next week, and MySQL Central at the end of October. Giuseppe and Shlomi both blogged on one of the recent changes introduced to MySQL 5.7.8-rc, where the setting show_compatibility_56 is now set OFF by default. The permissions issue reported by Giuseppe will be fixed. When show_compatibility_56=ON, users will now be able to select from either information_schema or performance_schema tables. This presents a more viable upgrade path for users that need some period to transition. The show_compatibility_56 setting itself will remain deprecated, as it was from its introduction. This signifies that we intend to remove INFORMATION_SCHEMA.GLOBAL_VARIABLES in a future release. Outside of the scope of today’s update, my colleague Mark Leith has also volunteered to blog with examples of how the new performance_schema tables now expose variables down to the thread-level. This will add more context as to why we are moving this meta data from information_schema to performance_schema. Thanks Mark! So thank you again to Giuseppe and Shlomi for helping make a better MySQL. We’re delighted to incorporate your feedback! In order to make it easier to work with data stored as binary strings (BINARY/VARBINARY) we are considering extending the &,|,^,~,<<,>> operators, to accept any-size binary strings and return binary string data as response. This can be useful for several complex data types not covered by the basic SQL data types (e.g. working with IPV6 addresses, manipulating UUID, etc). All binary string values are comparable. When binary large object string values are compared, they shall have exactly the same length (in octets) to be considered equal. Binary large object string values can be compared only for equality. For binary string values other than binary large object string values, it is implementation-defined whether trailing X’00’s are considered significant when comparing two binary string values that are otherwise equivalent. Thus, the standard allows binary strings to be zero-padded in the least significant part for comparisons (right-side). If you’re interpreting binary data as a hexadecimal unsigned integer, you would expect the operand with smaller size to be zero-padded to the left side. So an easy approach to avoid confusion would be to allow the operators(^,&,|) to only work with same size operands, thus avoiding any confusion over whether padding occurs in most or least significant part. Another aspect to be mentioned is that the old behavior with INT arguments would be preserved. Example SELECT 23 & 4 would still return a numeric BIGINT response: 4. MySQL has two ways of representing hexadecimal string literals: x'val' and 0xval (where val contains hexadecimal digits 0-9, a-f, A-F). The difference between the two is that the first is SQL standard and has a constraint: the number of hexadecimal digits must be even, the second version is not standard and does not require an even number of characters (it will be zero-padded on the left side in case of even number of characters). But there is one issue, in numeric contexts, hexadecimal values act like integers (64-bit precision) and in string contexts, they act like binary strings. So currently when executing SELECT x'10000001' & x'00000001' the operands get converted from VARBINARY to BIGINT(int64), with loss of any parts beyond 64 bits, and this returns BIGINT; with our change, this would return BINARY(4), breaking existing applications. That’s something that can be solved with a new sql_mode named BINARY_BIT_OPS_YIELD_BINARY, off by default for backward-compatibility; if turned on, bit operation on binary strings will yield BINARY result (or an error if operators are not of the same size). The alternative would be to introduce new functions. Example bin_and(x,y), bin_or(x,y), bin_xor(x,y) that can take two binary string arguments of same length and return binary string. We are considering also other names like binary_and(x,y), binary_or(x,y), binary_xor(x,y). bit_and(x) already exists, it’s an aggregate function; we fear this could confuse users, though, fortunately both functions do a similar thing (they AND bits). Is it a good idea to implement bitwise operations for binary strings? Is the BINARY_BIT_OPS_YIELD_BINARY sql_mode necessary? Can you think of other use cases where this can be useful (UUID handling is one such case)? Thanks to Catalin Besleaga on the optimizer team for ghost writing this post. What I wanted to caution however, is that mysqlpump is not currently consistent. That is to say that currently each of the dump threads lack a synchronization point before they start backing up the data. This makes it currently unsafe as a general purpose backup replacement. The mysqlpump developers are aware of this limitation, and are busy adding this feature into the utility. Edit: This functionality was added to MySQL 5.7.11. In the MySQL team, we have been working really hard on refactoring the optimizer and improving the cost model. The hacks of storage engines lying to the optimizer are being rolled back, and your chances of getting an optimal query plan should now be much higher than in prior releases of MySQL. Find an example where the optimizer picks the wrong execution plan for InnoDB tables but is correct for MyISAM. If you can demonstrate a reproducible testcase, I have a polo with MySQL 5.7 Community Contributor on it waiting for you. 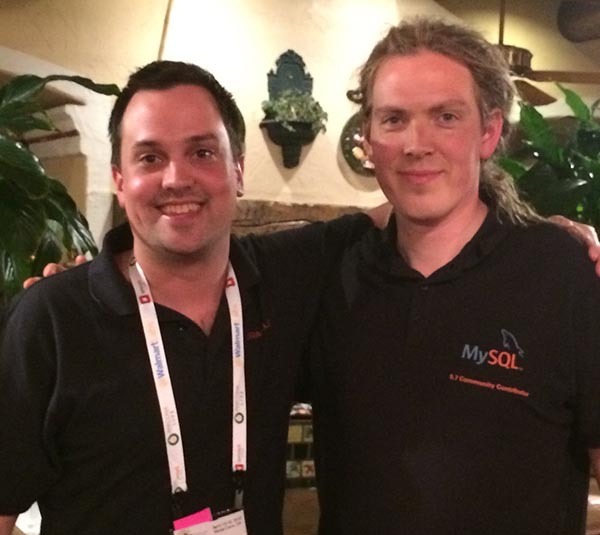 The MySQL 5.7 Community Contributor Polo, as modeled by Daniël van Eeden. I’m the guy on the left.